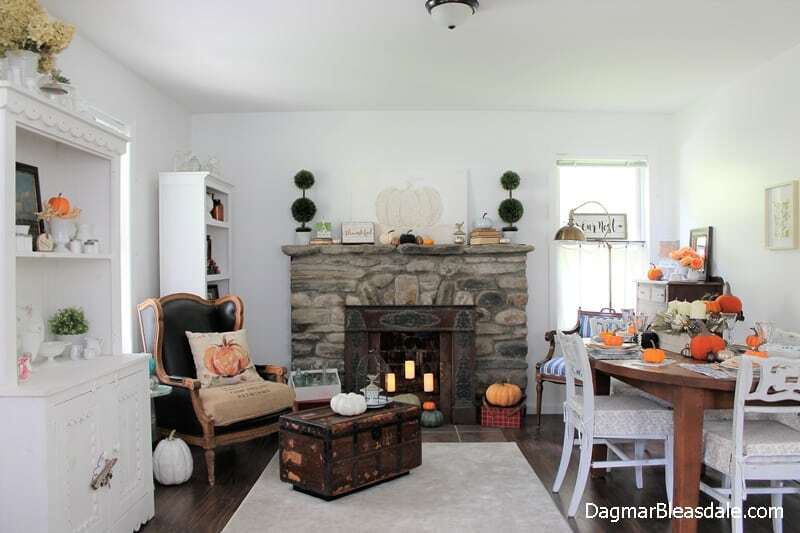 After writing the blog post about stunning cottage gardens yesterday, I was inspired to work on our own cottage today. 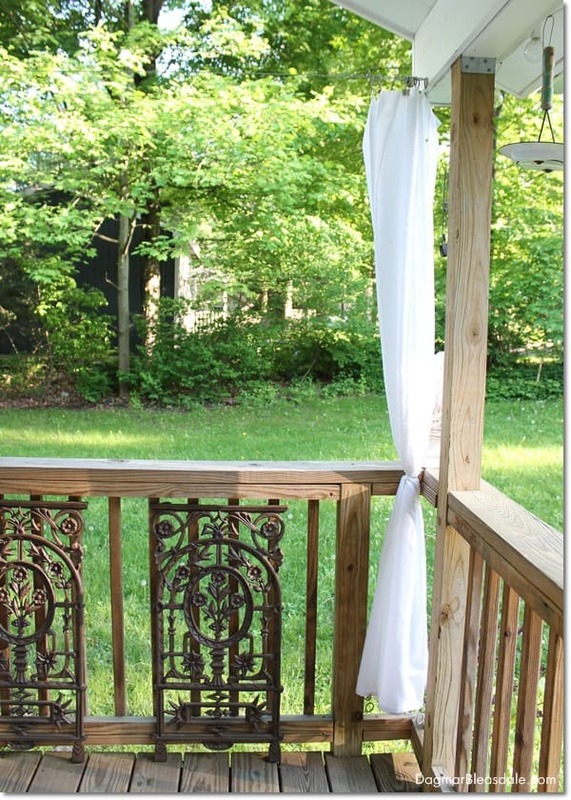 I did work on our garden a bit, but I’m even more excited to show you that we finished another project on our porch: we added DIY porch curtains to it! I love our porch. It’s one of my favorite features of our Blue Cottage, but since we moved in almost two years ago, we haven’t really been able to use it much at all. 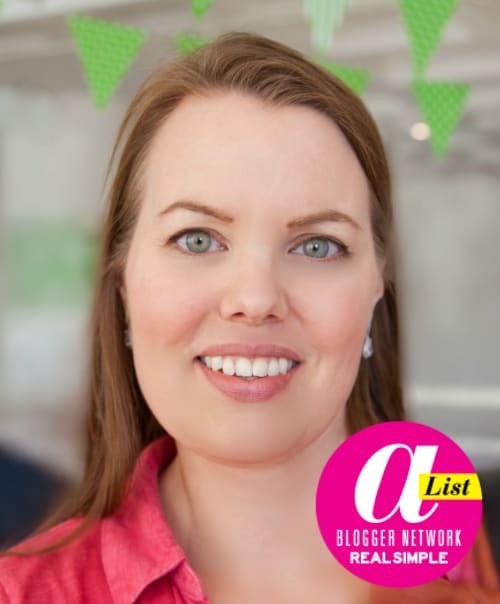 This post contains affiliate links – read more here. You can click on the pictures to buy the product. 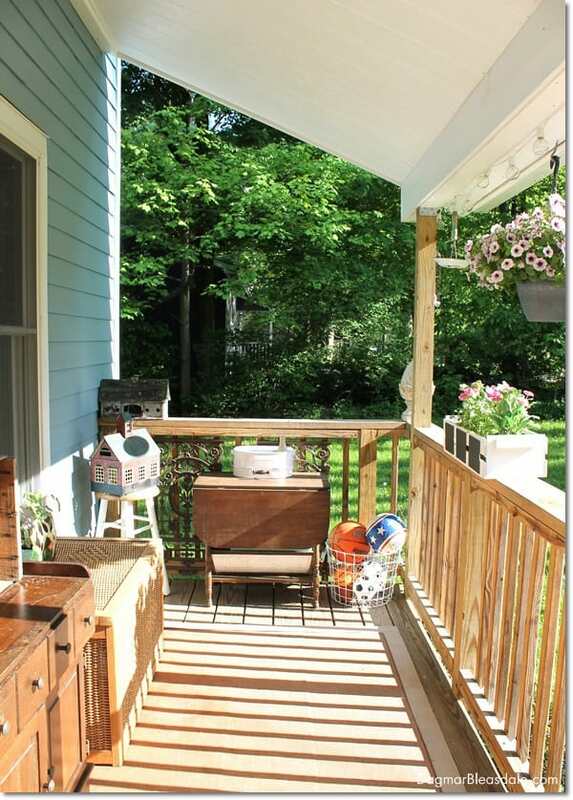 There is always so much stuff on the porch because we are short on space. We don’t have a garage, a shed, or a basement, so we usually have a lot of extra stuff on our porch that really doesn’t belong there. And every time it rains, I have to move the wood furniture to the center of the porch and cover them with plastic tarps or they’ll get ruined. That not only doesn’t look nice, it’s also just annoying. I’m not able to enjoy the porch like I would like because I’m constantly moving things. 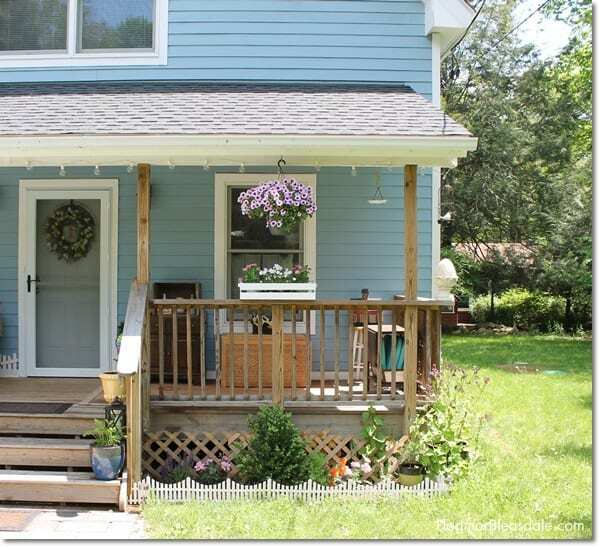 So I came up with a plan to add curtains on the sides of the porch that I can pull out when it’s raining. This way, I can leave the furniture in one spot. 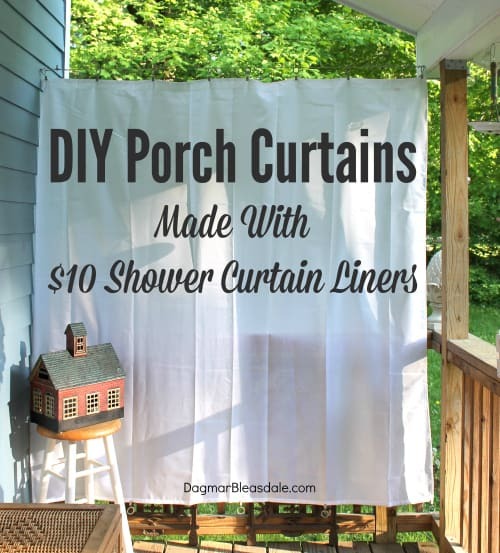 I got busy searching for DIY porch curtains on Pinterest and found a lot of posts — but they all featured curtains made out of drop cloth or burlap or bed sheets. 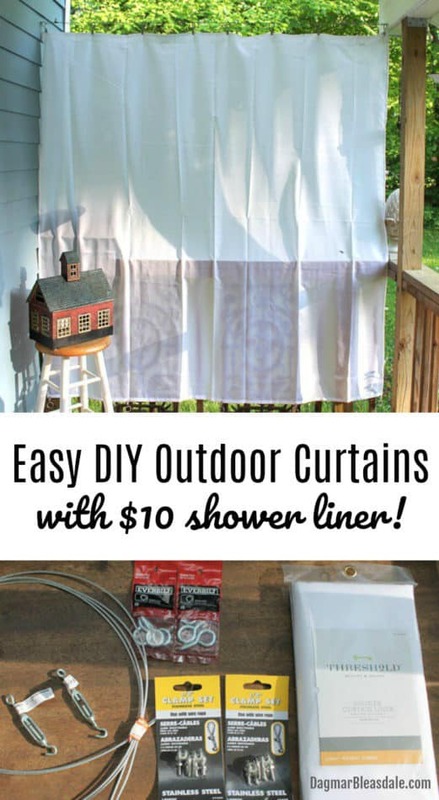 Then it hit me: why not use fabric shower curtain liners? I found a $10 shower curtains liners that feel like fabric and are even machine washable! I also researched the best way to hang the shower curtain liner. 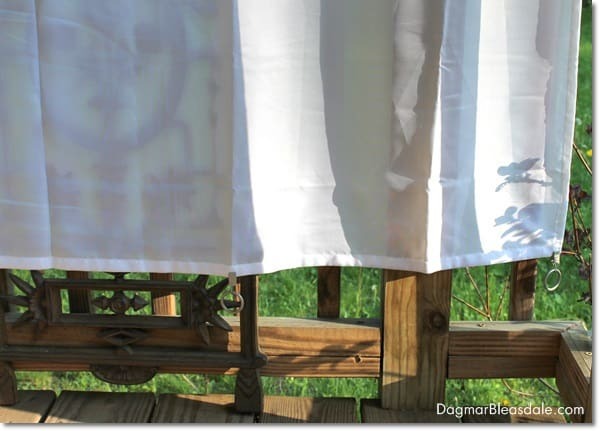 I could have used a rod, or piping, and add eyelets and many hooks to our porch, but I found the easiest way to hang these DIY porch curtains. All of the hardware only costs about $15 for both curtains. 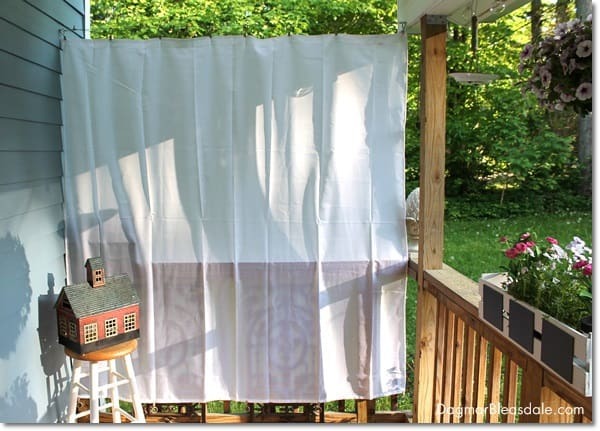 This is seriously the easiest tutorial to hang DIY porch curtains — much faster and cheaper than any other tutorial I’ve found! Don helped me with drilling the holes for the hooks while I put together all the parts, which only took a few minutes. Can we get a drumroll for my handsome husband being in a picture? Don is a finish carpenter and builder and can build you a house from the ground up, but he doesn’t like to get involved in my DIY project. I’m hoping to persuade him to be in more posts from now on. He is so skilled and can help me so much, and I like working with him on projects. 1. 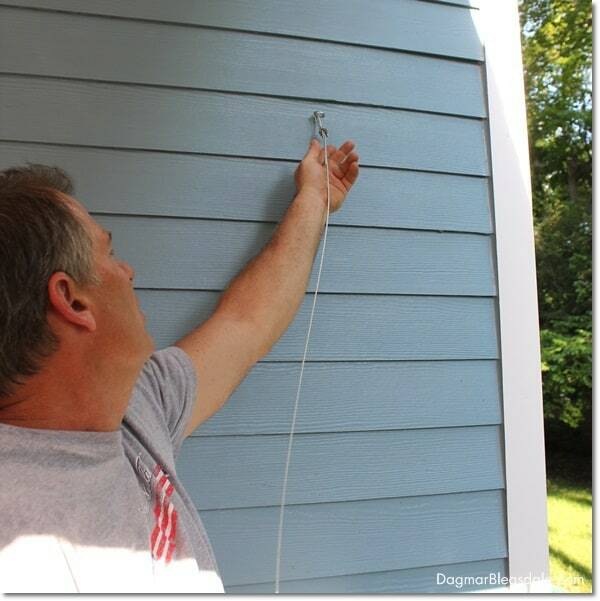 Decide at what height you want to anchor the rope and mark two level holes for the hooks on either side of the porch. 2. Pre-drill the two holes for the screw eyes and screw in one on one side. 3. Put one end of the wire through one screw eye, make a loop, and secure it with a wire clamp. 4. Put the other end of the wire though the turnbuckle, make a loop, and secure it with a wire clamp. 5. Then slide the curtain clip rings over one end of the wire. This is what your end product should look like before you hang it. I decided to use 8 clips, but then nice thing about using the turnbuckle is that you can easily take it off from the screw eye and add more clips to the wire if needed. 6. Now screw in the screw eye with the wire attached to it on the other side. 7. Hook the turnbuckle into the screw eye on the other side. 8. Tighten the turnbuckle until the cable is rigid. 9. Now you’re ready to attach the shower curtain liner to the clips. 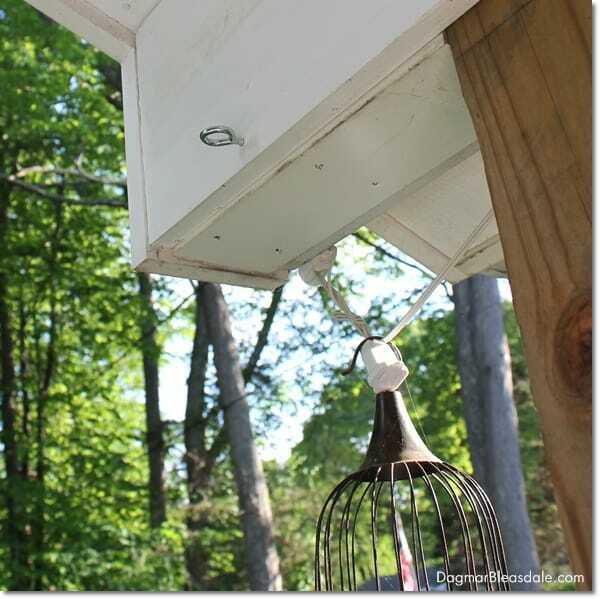 One liner was perfect for our porch, but if yours is larger, you might want to add two liners on each side, and add another wire clamp to make sure the wire is secured for the extra weight. There you go, my DIY porch curtains that cost less that $20 each and only took half an hour to put together! As you can see, the liner doesn’t reach the floor, but that doesn’t bother me for now. I could add another piece of curtain liner with fabric glue later, but I think it will keep enough rain from the furniture like this. 8. 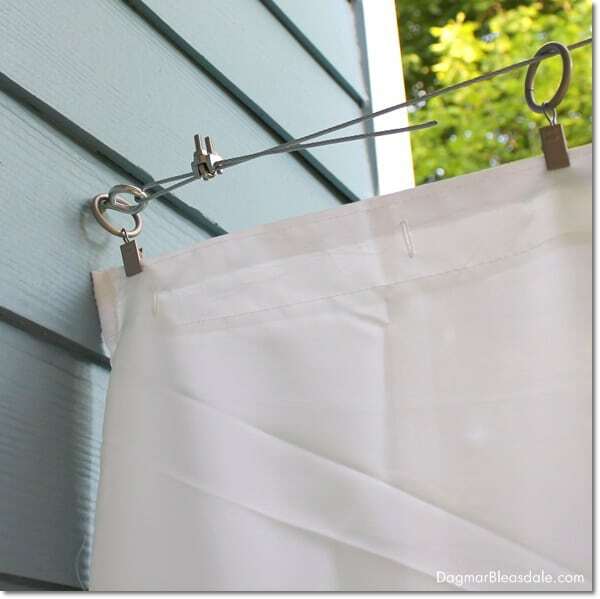 Add curtain ring clips to the bottom of the shower curtain liner to weigh it down so it doesn’t fly around when it’s windy. You could also add something else to the rings that is heavier, or you could hang the whole liner upside down so that you can use the ring holes in the liner to attach something heavy with strings. I’m going to buy more of these clips to weigh down the liner. If I find that the clips are not strong enough to hold the liner when it’s wet, I’m going to switch them with shower curtain rings and use the liner holes at the top of the liner, but I want to see how this setup works out first because I like how easy it is to detach the whole liner from the clips. I’m really happy with the look of this, and that it not only keep the rain off the porch but gives us added privacy if we want it. 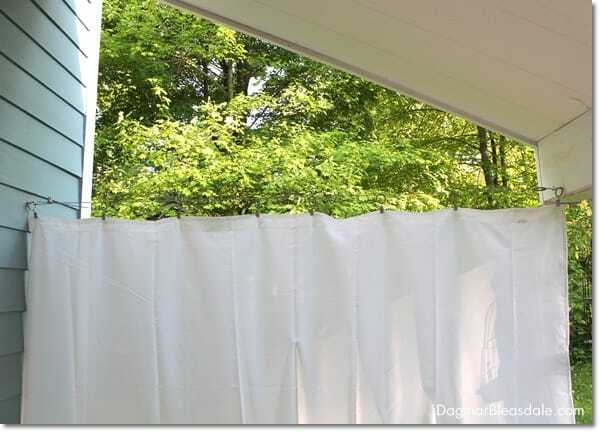 While not in use, the curtain looks like this, or you could take it down and just put it up when it’s about to rain. What do you think of my cheap porch curtains? Great idea! thanks so much for your post. 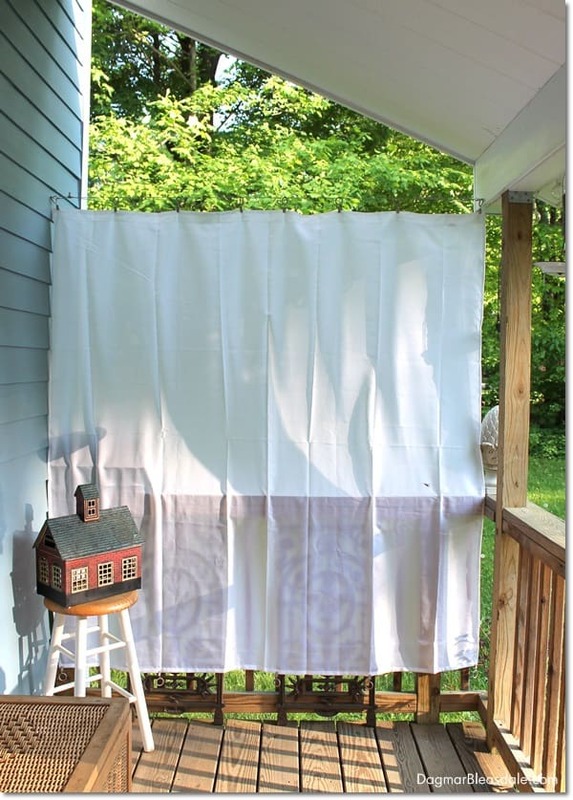 I was also LOOKING FOR SHOWER CURTAINS TO SHIELD MY VEGETABLE GARDEN AND WAS SURPRISED NOT MUCH CAME UP ON A GOOGLE SEARCH until i saw your post. i DO HAVE 50% SHADE cloth but it only covers the top like a roof, i needed something for the side where the late afternoon sun shines through the side and literally fries my pepper plants. here in arizona it is 115 degrees in the shade! 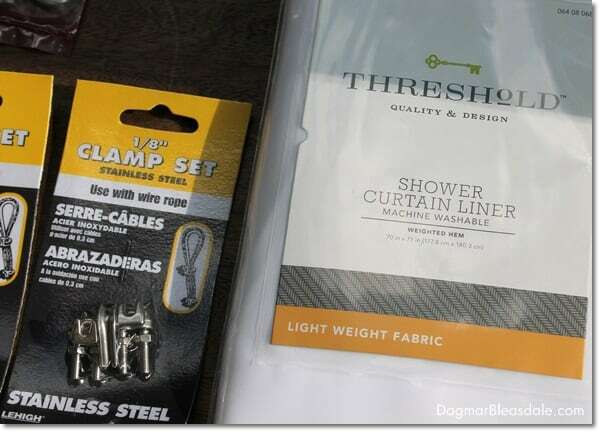 now, i found a heavier gauge shower curtain liner for $5 (walmart). it’s hotel weight so it won’t fly around as much. It has metal reinforced eyelits and 3 heavy gauge magnets on bottom. one idea to weight it down at the bottom is to use a rock or a weight such as you’re already using. get a hole punch or put metal eyelits along the bottom if you want, then tie or fasten the weight to the bottom. for now i put a rock inside a small baggie and stapled it to the bottom. but be careful your curtain isn’t located by a window because in heavy wind might blow into a window and hit against it and break the window. this almost happened to me but i have secured it down. your curtain looks lovely on your porch. now, here in arizona i am not caring how it looks but if it will protect my garden :) but i think a shower liner looks better than a bed sheet! 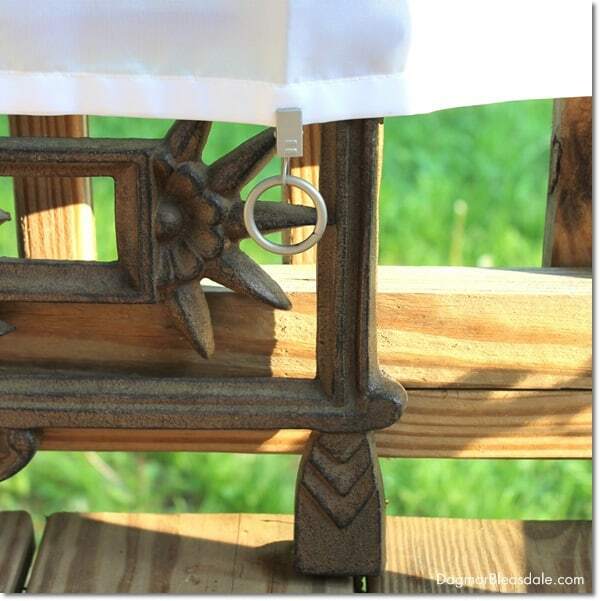 thanks for your post and details and photos, it really helped me figure out how i was going to do it, even though i did it with shower curtain rings that hook to my eyelits of my existing shade cloth. Thank you, Sharron! I’m glad you found the post helpful. Oh and by the way you can get longer shower curtains at Target …. stops the sides from blowing in the wind. I also use shower curtain liners as porch curtains. Last year to weight them down I used fishing weights attached along the bottoms of the curtains, but in stronger winds that wasn’t enough. This year I plan to put a wire in the bottom hem, making them more like a divider panel. Hopefully, they will slide easily back and forth, and solve my wind problems. Thanks for that idea, Althea! wonderful idea. 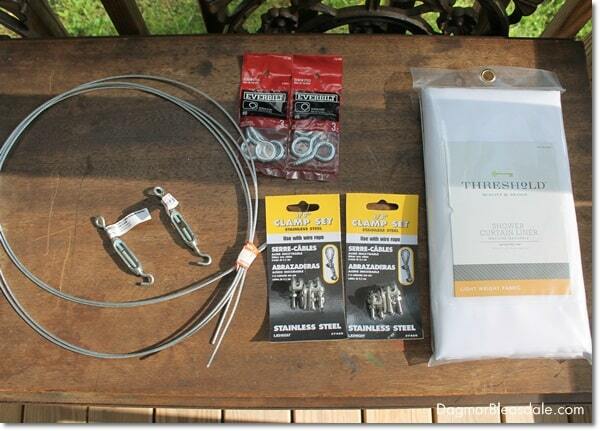 Get some small divers weights and clip on bottom i also was able to purchase extra long shower curtain on line. Hi Agatha, I should see if I can find extra long shower liners. Thanks for the tip! Hi Karen, I’m so glad this will work for you! It’s been raining here and these curtains are working great. Great idea! I have curtains I bought years ago from a sale for .10 each. They are curtains that hung around hospital beds. They are very heavy, but I used the same kind of cable and hooks that you did. But I do have to take them down and wash them every year, so I will be keeping your idea in mind for the next time. 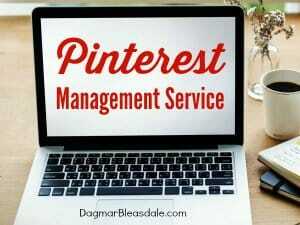 Thank for the idea and I am pinning! Hi Pamela, thanks so much for your comment! I love this idea I did it with the shower curtains that have the weighted magnets on the bottom so it doesn’t blow too much with the breeze. I also hot glued magnets onto the posts to hold them on place better. When tied back I have an extra magnet to keep them in the tie backs. It has lasted 3 yrs so far and looks great! 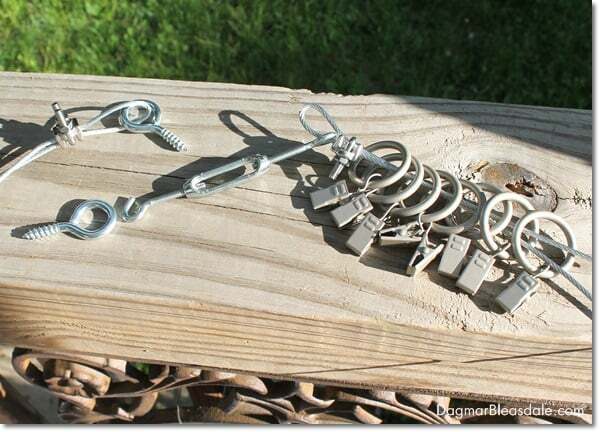 That is such a great idea, to use magnets! Thank you! I too used the magnet weighted shower curtains. 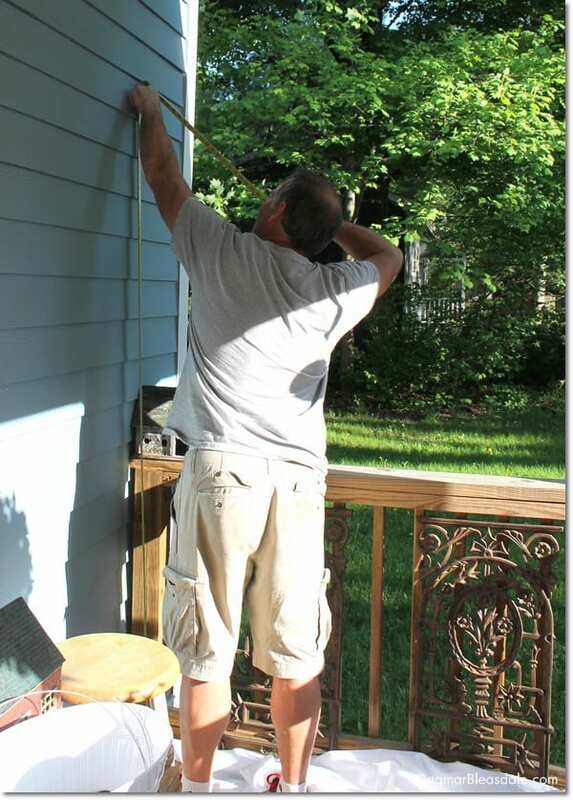 i pull them back to one side at the ends of my long flat front porch. your idea of magnets is great! Prevents damage, etc. Thanks so much for the idea! I’ve also gone to ZEN PRODUCTS online and purchased very very inexpensive items that can be used for many things such as this for a party,as well as their pillows,etc. thanks again. love everyone’s ideas, & this site has the clearest directions…and so friendly! I too used shower curtains to line my patio . Since it was a lot bigger I had to use 2 curtains to create one panel. So I chose a off white and a chocolate brown. I cut the brown one in half and sewed it to the bottom of the off white panel. I loved the idea that they handle the rain in one season and block the sun in another season. They lasted about 4 years of being left up all year around.